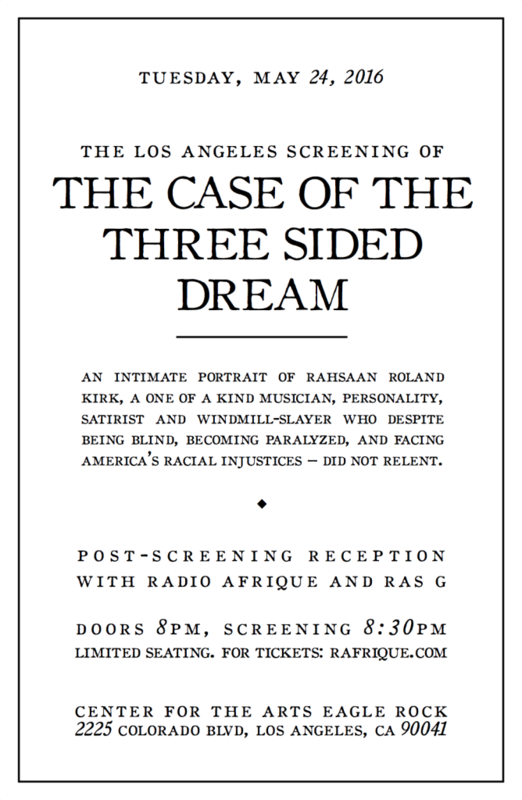 Radio Afrique and Center for the Arts, Eagle Rock are proud to present a special limited engagement screening of the award winning film “The Case of the Three Sided Dream”. A documentary that tells the story of seminal multi-instrumentalist Rahsaan Roland Kirk. Kirk’s life’s work was exploring sound and making music. Beyond that, he was an outspoken activist who started a political movement to get more exposure for Jazz in America – particularly on TV. Dreams were important to Rahsaan – who went from blind infant, to child prodigy, to adult visionary, political activist, and finally to paralyzed showman who toured and played music literally until the day he died. They planted the seed in his mind to play three horns simultaneously. His name came from dreams. When asked about his religious beliefs, he would say: “I’m from the Religion of Dreams”.